For any minor health issues, how do we try to get relief? We could only think of visiting a local doctor or a medical store to diagnose the illness. We do not say that it’s a wrong practice, but in this era of widespread technology wouldn’t it be easy and convenient to get health related information right at our fingertips? The creation of modern digital health is great, but having devices and technologies that can also talk to each other is even greater. “e-health” or ”eHealth” is the use of information and communication technologies to meet the needs of patients, healthcare professionals and providers (doctors and hospitals) as well as policy makers (insurance companies). Broadly the term defines a technical development, a way of thinking and a promise to improve healthcare locally and globally. Specifically designed computer programs highlight the one-on-one interaction between the client and the provider, with the goals of public health approach and targeting large population segments. Interactive technologies are tempting for the patients, as they receive individual and customized feedback at their convenience. With eHealth they are better equipped to ask their physicians direct questions to understand their conditions and manage their health effectively. It has the power to strengthen patient-physician relationships. Providing patients with the means to handle their own health through eHealth application gives them a sense of increased confidence in their physicians and become comfortable dealing with their conditions. This refers to a service or software that manages, conveys, stores information and payment related to the delivery of healthcare treatment. Typically these eHealth applications are used by doctors, hospitals and insurance providers to record patient health information. The advances have allowed both patients and medical professionals to gain access to a variety of resources, making healthcare efficient and cost effective. eHealth applications includes electronic health records (EHR) or electronic medical records (EMR) providers and software systems. Today, digital health also known as mHealth, telehealth, health informatics or eHealth, is a foundation of health systems all over the world. Unquestionably, digital health utilizes latest information and communication technologies to develop a faster, more efficient and cost-reducing healthcare practice. 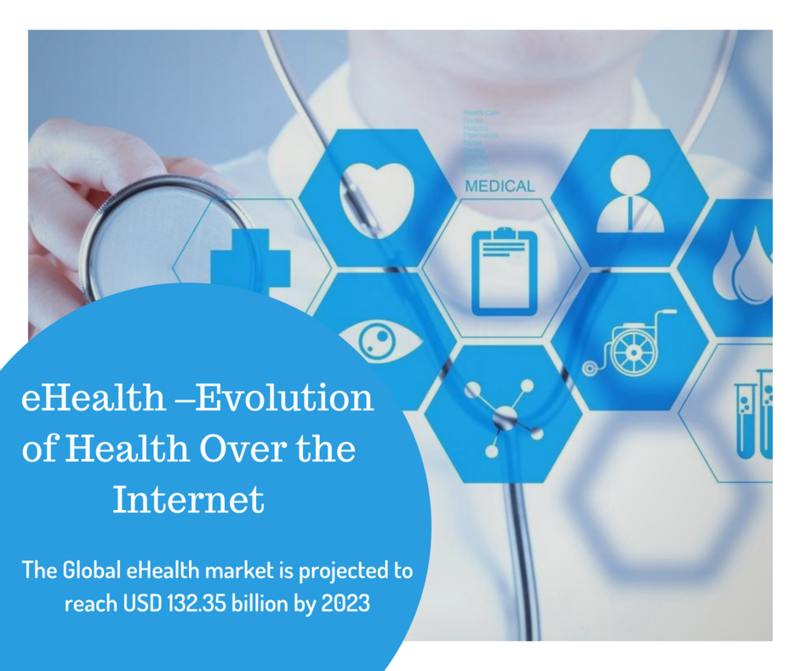 The global eHealth market is projected to reach USD 132.35 billion by 2023 from USD 47.60 billion in 2018, at a CAGR of 22.7% during the forecast period. The leading factors for the estimated growth are the mobile health and various health applications. Digital health is also ideal for new investments or startups. From 2010-2016 the funds invested for eHealth increased rapidly from $1.1 billion dollars to over $8 billion dollars. The advent of internet usage, mobile devices, social networking, etc. has become the basic reason for the growth of digital health. Patients can also access an inexhaustible amount of health information through the internet. The ease of transferring data and information in real-time is beneficial for both physicians and patients. With the advance of technology, there are also concerns about cyber-security. In 2017 the medical and healthcare industry accounted for 23.7% of publicly disclosed data breaches. This is one of the reasons many patients do not trust the exchange of health related data over the internet or through eHealth applications. Great experiences with technology are no longer a must-have, but it is an answer to caring for patients and helping those who care for them. With a unique combination of informatics, health policy, and clinical research, Bharat Book offers a specialized report on eHealth, providing comprehensive information analyzing the market by product, service, end user, and region. With the rise of beneficial technology in the health sector, we soon hope to see a healthy and a better world. “Dead” Batteries in your trash bin have 80% energy left UNUSED!! !